Photo credit: qisur on Flickr. How can you hope to do well if you don't do what is needed? Many IELTS candidates fail to get their desired band score not because their English is poor, but because they don't read the instructions properly. The NUMBER ONE rule in IELTS is to FOLLOW ALL INSTRUCTIONS carefully. The most common mistake made is in the Yes/No/Not given type questions. People tend to answer True/False instead. Another frequent mistake is that people give complete word answers when only a letter is needed. So, don't forget to read the instructions! On rare occasions, we've observed this phenomenon with our students. Some of them have indeed answered "yes-no" despite the explicit requirement of a "true-false" answer. A number of them have inadvertently failed to write their answers on certain item numbers. This have obviously led to deductions. 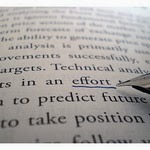 In the reading test, others would overlook important words even when they already know how to skim and scan. Finally, in the writing and speaking test, few tend to misunderstand the task, which consequently lead to off-topic essays and answers. Many times we've found that the mistakes occurred, not because they were poor in English, but because they simply didn't mark their keywords. Candidates should have a method for understanding the tasks and locating the answers. In our opinion, one cannot overemphasize the importance of marking keywords. 1) Keywords in the instructions. In listening and reading, you should mark the number of words that you can write on the blanks. You could even note if the instructions require you to write "true," "false," "yes," or "no." For writing, be sharp as to the given task type. In other words, does it require you to state whether you agree or disagree? Does it require you to identify the causes and provide solutions? In speaking (part 2), be alert with how the question is worded. If say, the task states, "Explain why...," then you should give a reason. If on the other hand it states, "Explain how/what/which...," then you should give additional information about a topic. Others would argue that this is unnecessary. Based on our observation however, some candidates end up with several unanswered items because they were not able to follow their logical sequence. This usually happens when the candidate is confronted with a map or a table where the placement of the items could be random or erratic. 3) Words that guide a candidate to the answer. Here, mark the names of people, places, things, or other proper nouns that you encounter during the exam. Also, mind the dates, as these could most likely help you find the correct answer. 4) Those that are already the answers. Are you listening or looking for synonyms? Are you anticipating words that provide a similar idea with that of the question? 5) Those which are in the question itself. "Alternative forms of transport should be encouraged and international laws introduced to control car ownership and use. To what extent do you agree or disagree." Examine the question carefully. Do you merely tackle encouragement of alternative forms of transport, or do you also include introduction of international laws? Also, do you merely tackle car ownership, or do you include also car use? Reduce errors, especially those which are the result of oversight. One of the ways to achieve this is to make it a habit to mark your keywords. Do keep in mind that the diligence you put in marking them would contribute to increasing your chances of getting a high band score. Negligence in marking them, on the other hand, increases the likelihood of committing unnecessary mistakes.